The extraordinary commitment of our volunteers should be acknowledged and rewarded whenever possible. There have been some impressive awards to members of the South East Region over the years. Pauline Lane served as Surrey County Chair from 2013 to 2018 supporting 11 groups in Surrey with guidance, advice and CAKE! 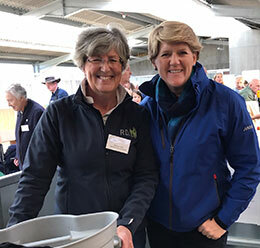 As a member of the regional team, Pauline organised our annual Regional Challenge Day, ran an arena at our Hickstead Dressage qualifier and then travelled to Hartpury for the RDA National Championships where she has run the awards table. Pauline is a long term RDA volunteer and in October 2010 she raised £45,000 for RDA by organising and leading a trek from the Dead Sea to Petra. Pauline continues to run Cranleigh RDA's Tuesday adult session and will continue to assist the region at our qualifiers. A wealth of knowledge and experience – and a beekeeper, and an artist – thank you Pauline for all that you have given us. Our President, Her Royal Highness, The Princess Royal, Princess Anne is a great supporter of RDA, championing our work as a national charity and visiting our groups as often as she can. Each year she presents a select group of volunteers across the country with the coveted President's Award. The President’s Award is the most prestigious volunteer award within RDA and is awarded for service of an exceptional nature over a period of not less than 30 years.